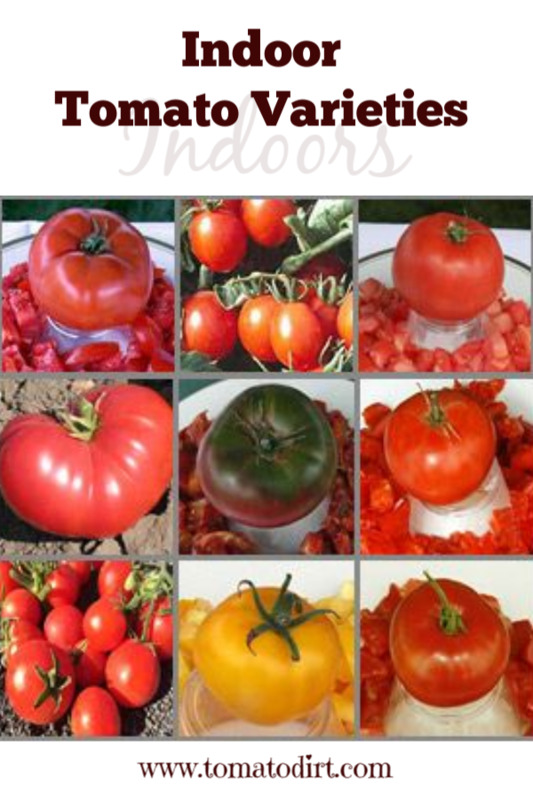 Indoor tomato varieties: which tomatoes grow best indoors? The best indoor tomato varieties are small-fruited plants, such as cherry or plum tomatoes. Small-fruited plants produce a large number of tomatoes. Because small fruit have less skin to ripen than large tomatoes, they ripen faster. Small size and quick ripening are helpful indoors where there may be limited light. If possible, choose indeterminate tomatoes to grow indoors. Indeterminates never set terminal flower clusters, but only lateral ones, and continue to produce fruit all season long, well into spring. Determinates, on the other hand, produce fruit for a couple of weeks. Then production fades out. Nevertheless, gardeners have had success growing the varieties listed here indoors, even though some are determinates. That’s because many are compact determinate tomato varieties and take less space indoors. Heirloom, determinate, 70-72 days, cherry red, (1 ½” round). Ripens early. Fruit is the size of ping pong balls, hence the name. Heirloom, determinate, 50 days, bright red, small-fruited (up to 5 ounces). Excellent cool weather variety that can set fruit at low temperatures, so is ideal for homes with low winter thermostat settings. Tomato lore has it that Siberia was smuggled out of Russia in 1975. Tommy Toe is said to have originated in the Ozark Mountains and carries a strong disease resistance. Hybrid, determinate, 85-88 days, red, super dwarf (tomatoes are about the size of croutons). The average 6” Micro Tom produces a couple of dozen tomatoes. Heirloom tomatoes vs. hybrid tomatoes - what's the difference?